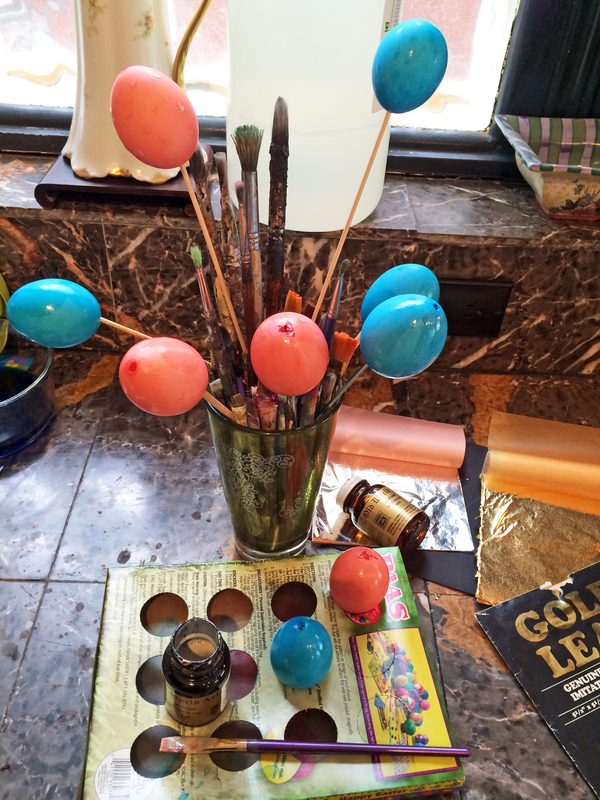 I had some fun getting all glam with my Easter eggs this year. 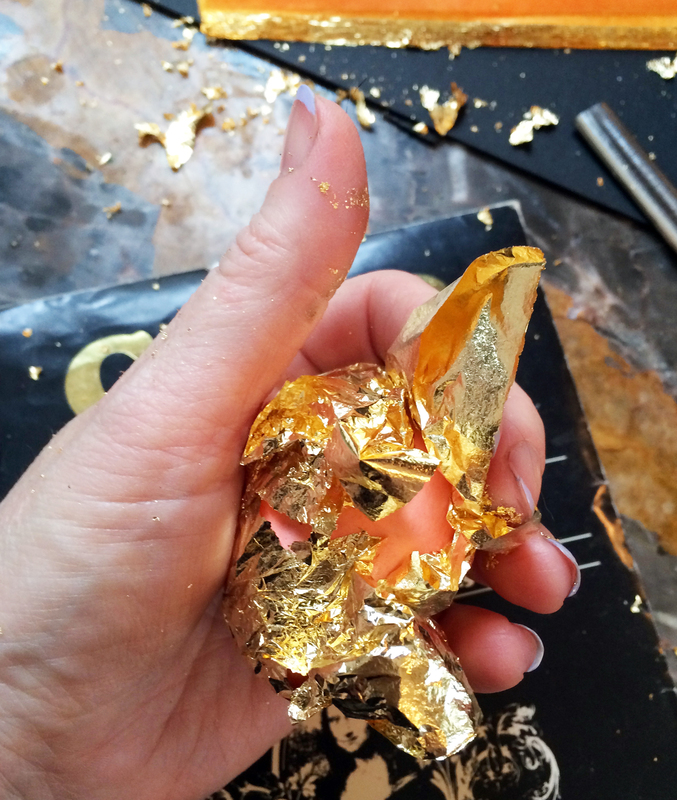 Gold & Silver leaf! It was easy. 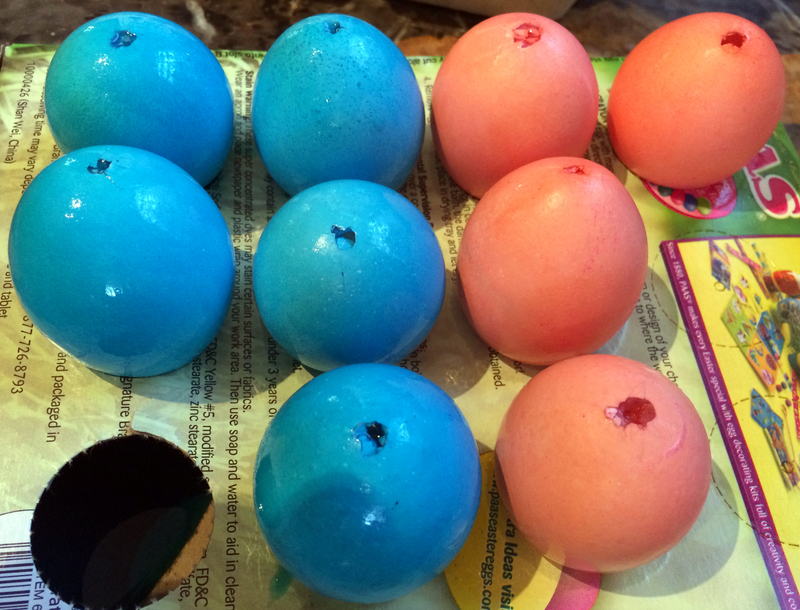 I dyed the eggs with standard dye, and limited it to two colors (though you can use any colors you like). 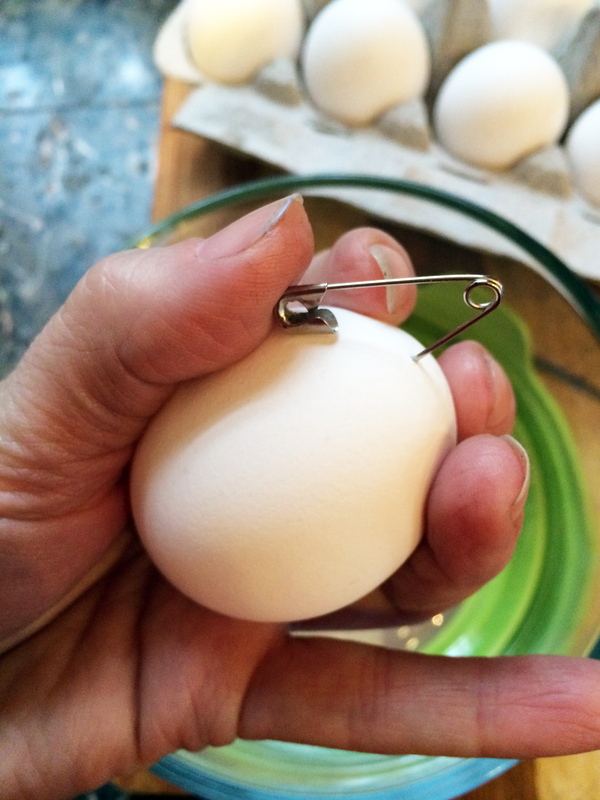 The tricky part was blowing out the eggs first. (I wanted them to keep long-term, and well, you wouldn’t want to eat them after the leaf is applied). First Step: Blow Those Eggs! This bit was tricky. I broke 2 eggs. They are very fragile once the holes are in them, so be gentle! I started by poking a hole in either end with a safety pin, then enlarging the hole with an Xacto blade. An awl would have worked much better, but I did’nt have one so I improvised. 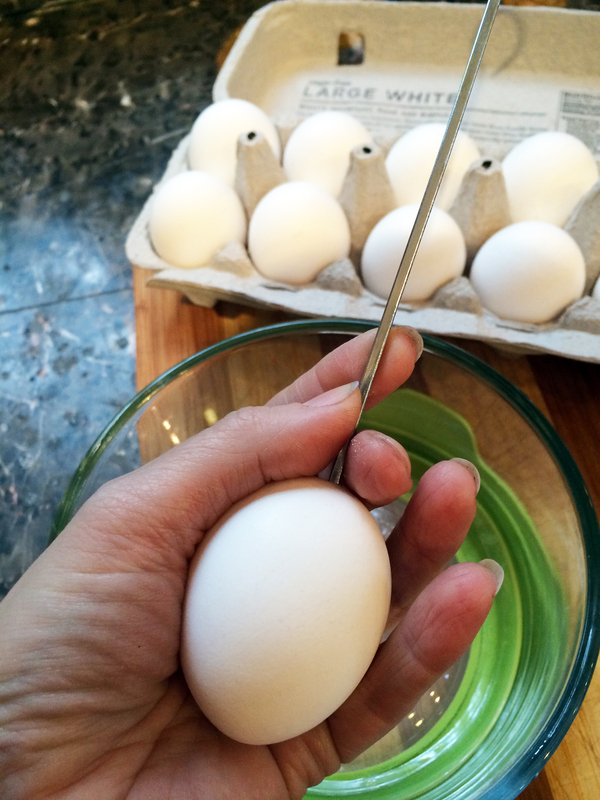 I used a skewer to gently “scramble” the yokes so they would blow out easily. Save the insides, make some omelets 🙂 I let them dry thoroughly overnight. Time to Dye! 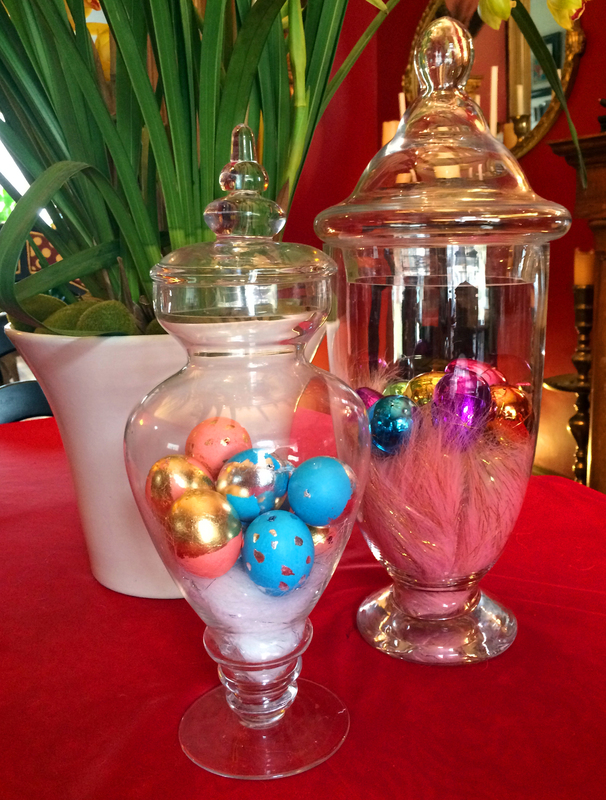 I used standard egg dye, $1 at Walgreens. The challenging part was getting them in the dye bath. 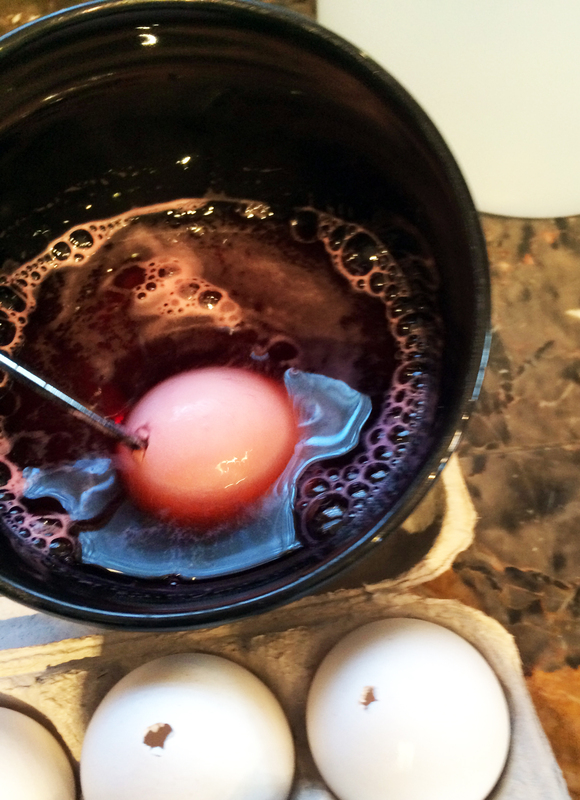 Because I blew out the eggs they had no weight to hold them under the dye, so I used the skewer to gently push them into the dye. I always have a bunch of leaf around from various art projects. (It is available at any arts & crafts store, and many hardware stores as well.) 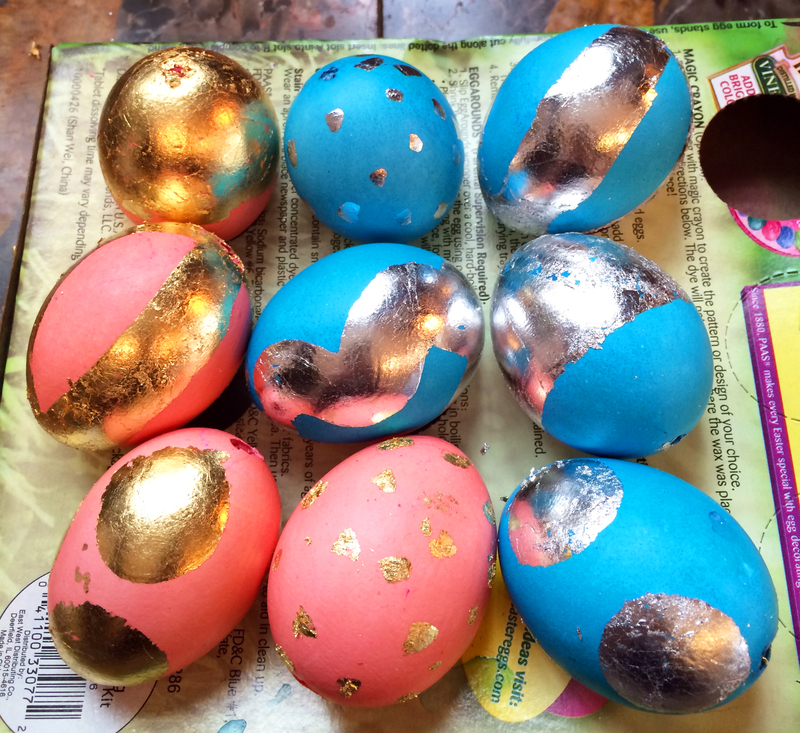 I had gold and silver on hand so I decided to use silver on the blue eggs and gold on the red eggs. 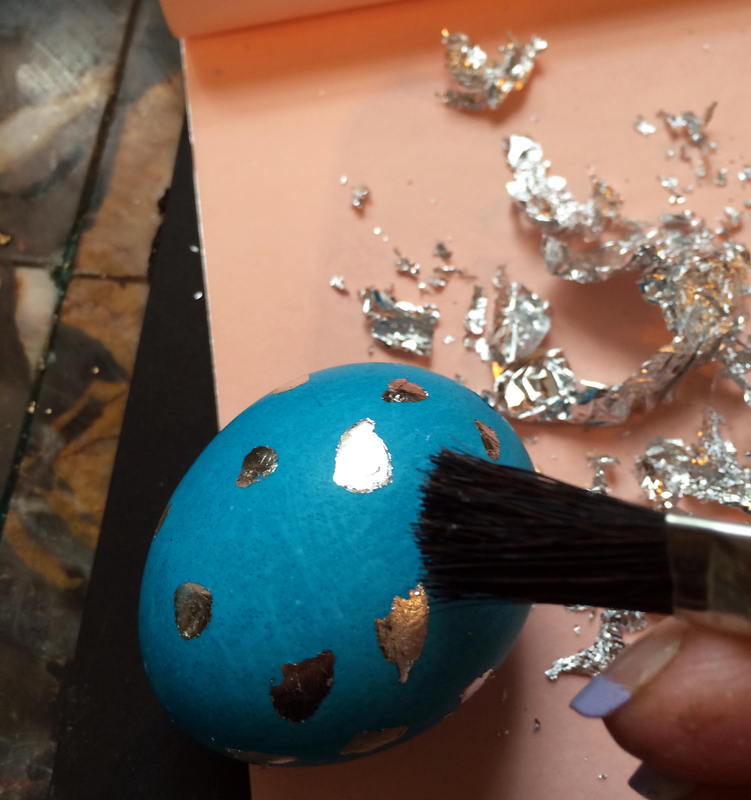 Use a soft, fine bristle paint brush to apply the adhesive size to the eggs in whatever pattern you like. (The size washes off with warm soapy water.) I chose a variety of large dots, small spots, stripes and half-egg patterns. 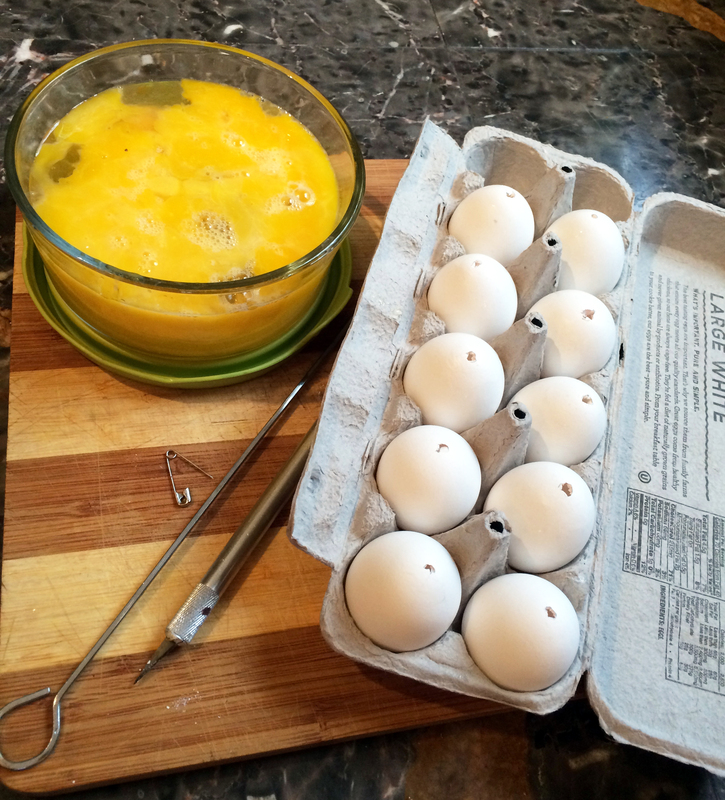 I put the eggs on skewers to hold them up so the size could dry without sticking to anything else. It dried fast (in about 15-20 minutes.) The leafing is easy but messy! The sticky size grabs the leaf well. 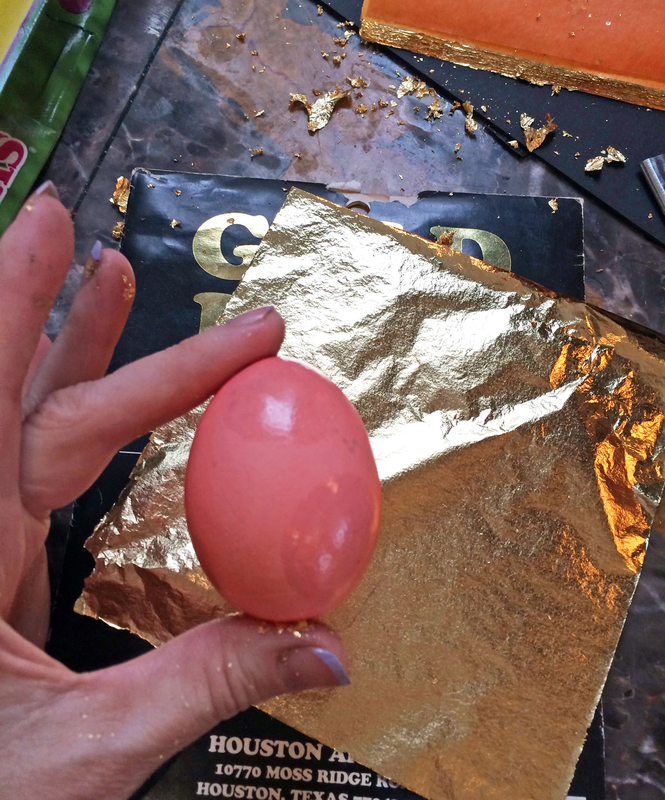 Just gently press the leaf onto the eggs, then use a stiff brush to remove the excess. That’s it! You can now either coat them with a clear coat or just display them if you’re lazy like me. 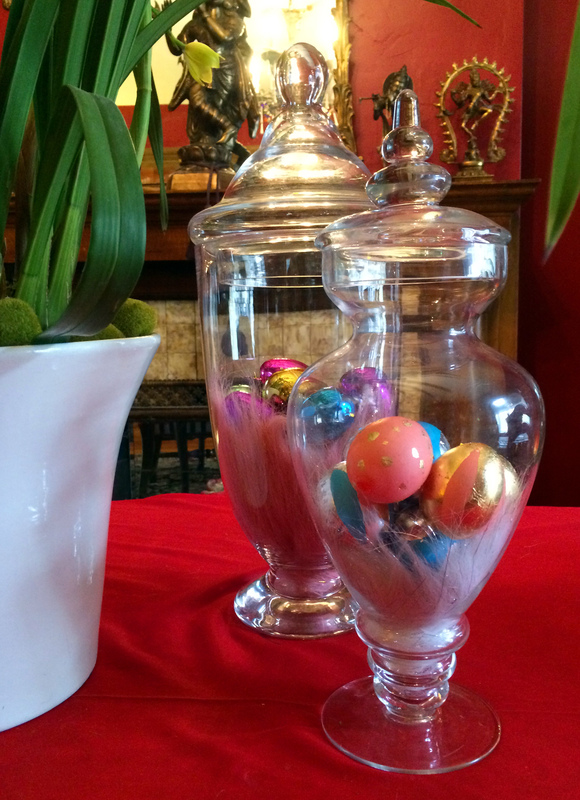 I put them in a clear apothecary jar. 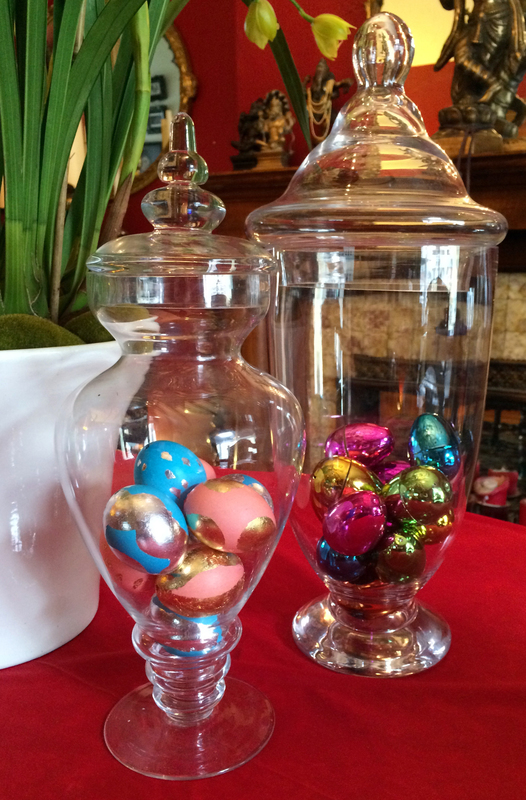 (I would like to make more eggs and fill the jar.) 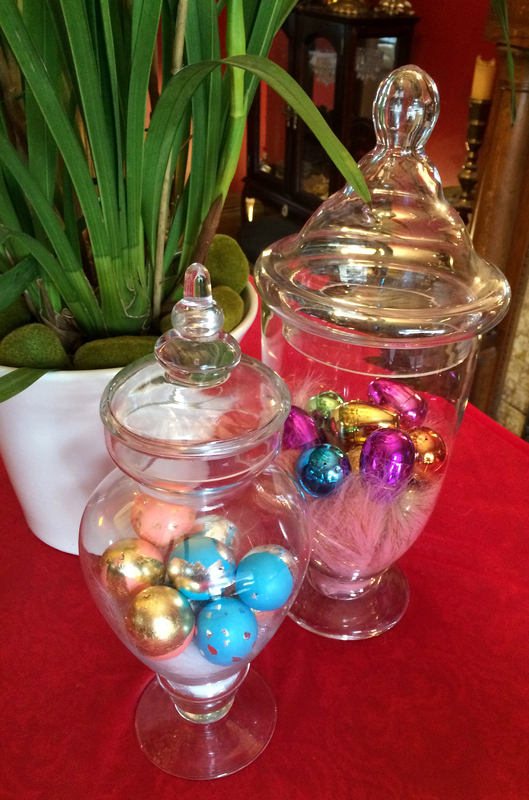 I also put some metallic plastic eggs I found at the thrift store in a second jar. FYI the orchid plant came from Trader Joe’s for $20, and has been going strong for over a month. The white pot and both the apothecary jars were thrift store finds. 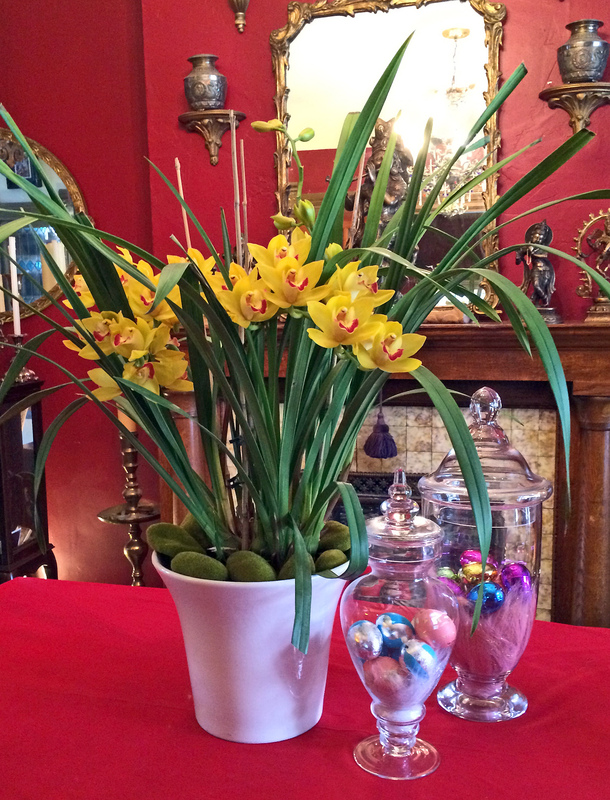 Happy Easter, Happy Spring, and a Joyous Passover to everyone! 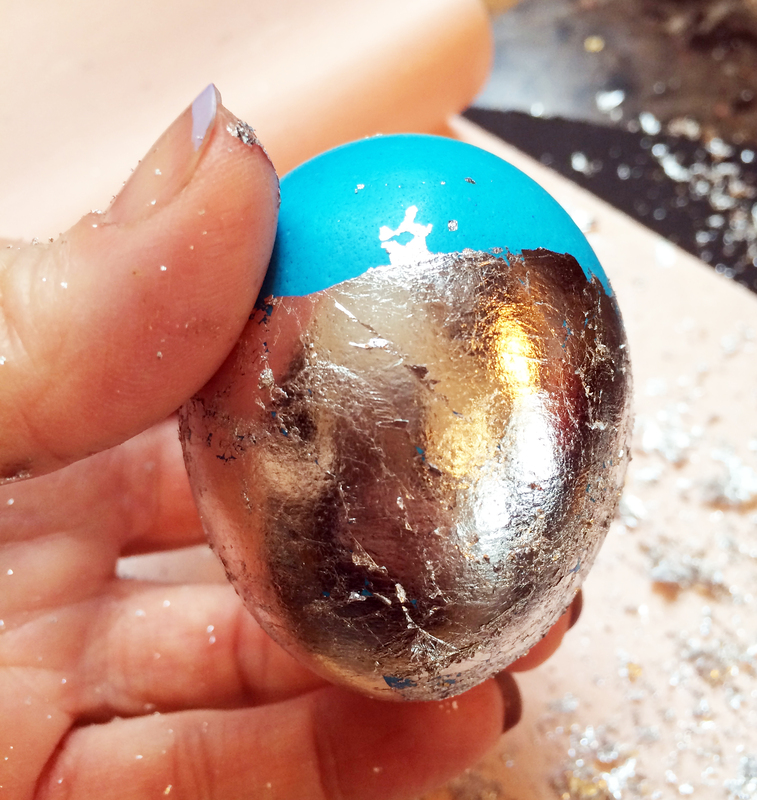 This entry was posted in DIY, Easter, Uncategorized and tagged DIY, dye Easter eggs, dye eggs, Easter, Easter centerpiece, easter crafts, easter display, Easter eggs, Gold & Silver leaf, gold leaf easter eggs, gold leaf eggs, leaf eggs, metalic eggs, silver leaf eggs. Bookmark the permalink.